After struggling to engage a digital native, millennial audience, Boston’s premium investment firm looked for a new approach. NorthOut leveraged best-in-class machine learning and design talent to uncover new insights on millennial customers in an effort to drive new marketing and design concepts. From idea to completion we imagined a better way forward. True to NorthOut’s ‘just get it done’ mindset, we leveraged a series of 3rd party datasets to meet our client’s goals without needing to deal with security issues. Uber APIs, Zillow, Census and our own Survey data all drove a massive, valuable database. Ran an AI Insights Sprint. Our unique AI Insights Sprints goes from data cleaning all the way to detailed findings in just weeks. Specifically we found unique spending habits in 1099 workers (Uber, TaskRabbit) which lead to a new marketing strategy. Designed a New App Concept. 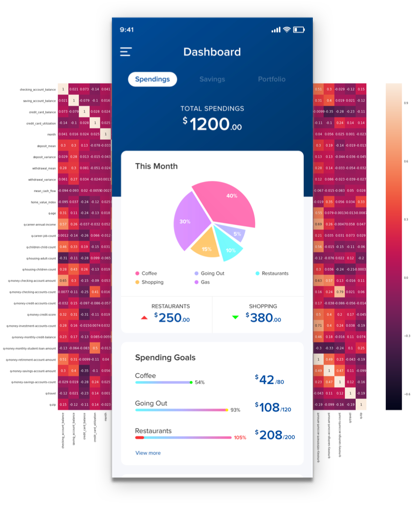 Beyond data, we designed a new mobile/social application concept that used similar insights to provide financial advice to millennial users. Combined with data, these helped key stakeholders drive budgets for continued learning. NorthOut focused on inter-team training to drive long-term value. Instead of working in isolation, our team’s co-located to make sure that we were sharing skills, processes and insights. We believe that passing knowledge on is just as important as the project outcome itself. Our workshop based approach helped seed AI and data ideas even outside of the core project team. Throughout our sprints, varied executives and team members joined to share problems, ideas and brainstorm. Blended Data & Design Talent. Our AI strategy emphasizes blending product and design teams early. This leads to optimal solutions rooted in real user problems, enables easy transitions all while driving alignment. Understanding how to leverage data efficiently and not just throw darts at the board is key to us winning new customers. Based on a our analysis, we suggested and designed an financial intelligence mobile application positioned specifically for the gig economy worker. In an API driven ecosystem, knowing the most optimal tools can make or break an app. We used Plaid for secure banking integration to drastically improve user experience and capability with minimal engineering investment. The value of data driven consumer & internal application is rewriting the rulebook for financial services. Whether increasing your teams velocity, taking a new approach to offshore development or creating next generation roadmaps, increased customer expectations, margin pressure and technology advancement make the time to act, yesterday. We’re ready.